As dynamic, productive, and exciting has Microsoft has tried to make the Surface RT tablet out to be, consumers can’t shake the perception that it’s just a bland bit of overpriced plastic—all its VaporMg cladding notwithstanding—that can do little more than surf the Web. Unfair? Maybe so. But as Wall Street digests that distasteful reality, so too should Microsoft’s marketing department. In fact, it’s eventually going to realize that as painful as the price cuts on the Surface RT have gone, they didn’t go nearly far enough. Amy Hood, CFO of Microsoft. Microsoft reported fourth-quarter revenues Thursday that came in nearly a billion dollars less than what analysts expected, thanks to a $900 million writedown of the Surface RT tablet. Amy “Red Riding” Hood, Microsoft’s new chief financial officer, was seemingly thrown to Wall Street’s wolves, as chief executive Steve Ballmer and other chief executives were absent from the call—unlike the packed house that accompanied the “One Microsoft” reorganization. To Hood’s credit, she dodged nimbly, scattering bland crumbs of data that the analysts meekly accepted. It shouldn’t be too hard to figure out how many Surface RT tablets the writedown represented: $900 million divided by the per-unit price cuts—equating to $150 for each version of the Surface RT—will equal the number of Surface RT tablets sitting idle on Microsoft’s shelves, said Patrick Moorhead of Moor Insights and Strategy. The grand total? Slightly less than 6 million Surface RT tablets, according to the math. That’s a mind-boggling number where the Surface is concerned. In May, IDC estimated that Microsoft sold 900,000 Surface tablets during the first quarter of 2013, including the Surface Pro. During the fourth quarter, IDC reported that Microsoft shipped—not sold—another 900,000 Surface RT tablets. And that’s it. That’s the sum total of what Microsoft has sold so far: probably a bit less than 1.8 million Surface tablets, in total. In other words, that’s more than a year and a half of Surface RT inventory that Microsoft has on its shelves. Shortly before the call started, PCWorld was told that the Surface RT wasn’t dead, a position Hood backed up: “[W]e believe this pricing adjustment will accelerate Surface RT adoption and position us better for long-term success,” she told analysts. Well, it damn well better. So far, Microsoft isn’t giving up. But if Microsoft doesn’t watch out, the Surface RT may find itself sitting next to the HP TouchPad in the dustbin of history. And there’s the rub. In March of 2011, Hewlett-Packard revealed WebOS, an arguably elegant OS that featured a suite of basic apps, limited third-party support, and the ability to connect to the Web. Sound familiar? Where the HP TouchPad went, the Surface RT could follow. After announcing a pair of phones as well as the HP TouchPad, HP abruptly discontinued the TouchPad, discounting it to $99 to rid itself of the extra inventory. And before you could say “Sharknado,” the TouchPad was the Internet’s darling, selling so quickly that HP decided to make another batch. In general, Microsoft predicated the Surface’s value proposition on several things: the quality of its construction, including the VaporMg material and the kickstand; Microsoft’s own software and services; an apps market that would leverage the historical Windows developer base; and to a lesser extent, the novelty of a Windows tablet. Soon after, the Surface’s advantages were methodically knocked down: the Google Nexus 7, then the Apple iPad mini, made the Surface seem large and ungainly; the novelty wore off; and, of course, customers, developers and partners turned their collective nose up at Windows RT. It didn’t help that the Surface RT competed with Microsoft’s traditional OEM partners; Samsung, Lenovo, and others refused to offer their own Windows RT products. Time has been a bit kinder to Microsoft’s Metro apps, but the delays in convincing third-party developers like Facebook to sign on have undeniably hurt Microsoft. Right now, the average consumer most likely considers the Surface RT to be good for little more than surfing the Web and running Microsoft Office. At $349 for a 32 GB model—$150 more than the Nexus 7, which will be refreshed soon—the Surface RT just looks like a rotten deal. However, a 32 GB Surface RT is now $250 less than an iPad, a fact that Microsoft points out in its latest commercial. Will the recent price cut make up for a much weaker app environment? I'm not sure. The Windows RT brand appears heavily bruised. 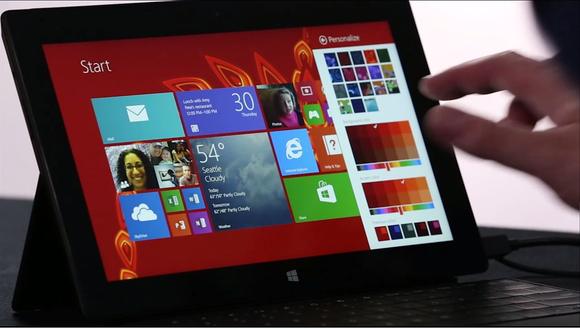 Microsoft must demonstrate the value proposition of the Surface RT tablet, pronto. To its credit, it’s done so with its latest commercials, emphasizing Office. But even with the value that Office brings, a further price cut looks inevitable to bring it in line with competing solutions. But if it does so, it looks even weaker than before. It’s an ugly situation. Moorhead, who worked at rival AMD for most of his career, knows the analogy well: a massive, power-hungry chip for the 1 percent of the high-performance computing world, the Itanium was notoriously dubbed the “Itanic” following Intel’s grandiose pronouncements of its success and its quick trip out of sight, languishing within HP’s highest-end systems, when Intel’s own Xeon chip had largely replaced it elsewhere. Moorhead sees Microsoft pursuing RT with the same dedication. “The future is absoutely Metro,” Moorhead said, and he’s right. Even with the changes made to Windows 8.1, the Start page isn’t going away, and the associated Metro apps aren’t either. The reality is that nobody really wants to use the Windows desktop in tablet mode—but Microsoft included the Touch Cover keyboard with it, implying that the Surface RT is just as much a PC as a tablet. Moorhead said that he sees Metro’s problems going away in two years—a real possibility, as more users become used to the Windows 8/8.1 environment. By then, however, it might be too late for the Surface RT. Microsoft needs to make the Surface RT attractive, fast. Otherwise, it might end up in a watery grave. Or a landfill. Updated at 9:00 AM PT on July 19 with a reference to Microsoft's latest Surface RT commercial.